(Steve Griffin | The Salt Lake Tribune) Dignitaries turns shovel of dirt during groundbreaking ceremony for the 200 bed, 60,000-square-foot Geraldine E. King WomenÕs Resource Center at 131 East 700 South in Salt Lake City Monday May 7, 2018. Shelter the Homeless is in the process of developing three new Homeless Resource Centers: two in Salt Lake City and one in South Salt Lake. Scheduled to open in July 2019, these resource centers are part of a broader change to how the current homeless service system helps individuals and families experiencing homelessness. The resource center model is designed to serve clients in a way that helps individuals move quickly out of emergency shelter, towards housing stabilization and independence. Each resource center is designed to serve a specific population, such as single women or single men. (Steve Griffin | The Salt Lake Tribune) Salt Lake City Mayor Jackie Biskupski speaks during groundbreaking ceremony for the 200 bed, 60,000-square-foot Geraldine E. King WomenÕs Resource Center at 131 East 700 South in Salt Lake City Monday May 7, 2018. Shelter the Homeless is in the process of developing three new Homeless Resource Centers: two in Salt Lake City and one in South Salt Lake. Scheduled to open in July 2019, these resource centers are part of a broader change to how the current homeless service system helps individuals and families experiencing homelessness. The resource center model is designed to serve clients in a way that helps individuals move quickly out of emergency shelter, towards housing stabilization and independence. Each resource center is designed to serve a specific population, such as single women or single men. (Steve Griffin | The Salt Lake Tribune) Dignitaries mingle following groundbreaking ceremony for the 200 bed, 60,000-square-foot Geraldine E. King WomenÕs Resource Center at 131 East 700 South in Salt Lake City Monday May 7, 2018. Shelter the Homeless is in the process of developing three new Homeless Resource Centers: two in Salt Lake City and one in South Salt Lake. Scheduled to open in July 2019, these resource centers are part of a broader change to how the current homeless service system helps individuals and families experiencing homelessness. The resource center model is designed to serve clients in a way that helps individuals move quickly out of emergency shelter, towards housing stabilization and independence. Each resource center is designed to serve a specific population, such as single women or single men. (Steve Griffin | The Salt Lake Tribune) Salt Lake City Mayor Jackie Biskupski speaks during groundbreaking ceremony for the 200 bed, 60,000-square-foot Geraldine E. King WomenÕs Resource Center at 131 East 700 South in Salt Lake City Monday May 7, 2018. Shelter the Homeless is in the process of developing three new Homeless Resource Centers: two in Salt Lake City and one in South Salt Lake. Scheduled to open in July 2019, these resource centers are part of a broader change to how the current homeless service system helps individuals and families experiencing homelessness. The resource center model is designed to serve clients in a way that helps individuals move quickly out of emergency shelter, towards housing stabilization and independence. Each resource center is designed to serve a specific population, such as single women or single men. (Steve Griffin | The Salt Lake Tribune) Dignitaries turns shovel of dirt during groundbreaking ceremony for the 200 bed, 60,000-square-foot Geraldine E. King WomenÕs Resource Center at 131 East 700 South in Salt Lake City Monday May 7, 2018. Shelter the Homeless is in the process of developing three new Homeless Resource Centers: two in Salt Lake City and one in South Salt Lake. Scheduled to open in July 2019, these resource centers are part of a broader change to how the current homeless service system helps individuals and families experiencing homelessness. The resource center model is designed to serve clients in a way that helps individuals move quickly out of emergency shelter, towards housing stabilization and independence. Each resource center is designed to serve a specific population, such as single women or single men. (Steve Griffin | The Salt Lake Tribune) Heavy equipment frames the groundbreaking ceremony for the 200 bed, 60,000-square-foot Geraldine E. King WomenÕs Resource Center at 131 East 700 South in Salt Lake City Monday May 7, 2018. Shelter the Homeless is in the process of developing three new Homeless Resource Centers: two in Salt Lake City and one in South Salt Lake. Scheduled to open in July 2019, these resource centers are part of a broader change to how the current homeless service system helps individuals and families experiencing homelessness. The resource center model is designed to serve clients in a way that helps individuals move quickly out of emergency shelter, towards housing stabilization and independence. Each resource center is designed to serve a specific population, such as single women or single men. State, county and city leaders joined in a ceremonial groundbreaking for the first of three planned resource centers in Salt Lake County to help the homeless find shelter, stability and self-sufficiency. The Geraldine E. King Women’s Resource Center on 700 South, east of State Street in Salt Lake City, will serve single homeless women exclusively with a 200-bed, 60,000-square-foot facility, providing overnight shelter, work and housing assistance, and health services. It is expected to open in July 2019. That’s when The Road Home shelter in downtown Salt Lake City is supposed to close. Whom it’s named for: Salt Lake City businessman Pat King donated $4 million in December 2016 to build the shelter in honor of his mother, who died in April 2016 at age 97.
Who developed it? Salt Lake City nonprofit Shelter the Homeless has three centers planned, two in the capital city and one in South Salt Lake. The resource center model aims to help people move quickly out of emergency shelter and toward independence. Harris Simmons, chairman and CEO of Zions Bank and the nonprofit’s board president, hosted Monday’s event. 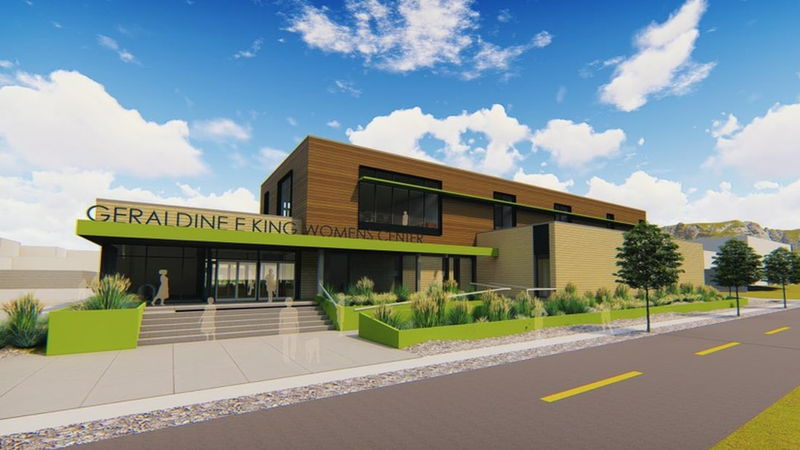 A rendering of the Geraldine E. King Women’s Resource Center, to be built on 700 South in Salt Lake City. Ground was broken on the project on May 7, 2018, for a planned opening in July 2019. What’s next: Groundbreaking is imminent for another shelter on High Avenue in Salt Lake City that will have 200 beds for men and women. The third shelter in South Salt Lake will serve up to 300 men but is behind schedule amid a number of roadblocks and faces an end-of-June deadline to start construction. Correction: May 7, 9:40 p.m. • An earlier version of this story misstated the name of the Geraldine E. King Women’s Resource Center.